Eaton senior Seth Bowman scored a 3-1 sudden victory over Hunter Ross of Milton-Union in the third place match during the 49th Annual Eaton Sam Ridder Invitational on Saturday, Jan. 26. The Eagles placed sixth overall with 106 points. Eaton’s Chris Weadick battles Logan Raney of Franklin during a third place match at the 49th Eaton Sam Ridder Invitational on Saturday, Jan. 26. Weadick scored an 18-8 major decision in the match to help the Eagles to a sixth place finish as a team. EATON — Mark Silvers wasn’t sure what to expect from his Eaton wrestling team when it hosted the 49th Eaton Sam Ridder Invitational on Friday and Saturday, Jan. 25-26. Eaton, which scored 106 points, ended the tournament with six placers and finished sixth overall in the 23 team field. Hamilton Ross won the team title with 181.5 points. Chaminade Julienne was second with 161.5 and Valley View was third with 147. Milton-Union was fourth with 121 and Stebbins was fifth with 113. National Trail was 21st with 39 point and Twin Valley South was 22nd with 13. The Eagles has six wrestlers place in the top six. Chris Weadick was third at 152 pounds, scoring an 18-8 major decision over Logan Raney of Franklin. Seth Bowman earned third place at 285 pounds with a 3-1 sudden victory over Hunter Ross of Milton-Union. Owen Hewitt placed sixth at 120 pounds. “He stepped up and won a couple real good matches. Lost a couple he was capable of winning but the thing is you learn more from a loss than you’ll ever learn from a win. He’s going to be fine come to for the league and for the sectional, district and state series. KeAnthony Bales placed fourth at 145 pounds in his first varsity tournament. “That was just awesome. I couldn’t have been any happier for him. He’s a kid who came out last year as a first-year wrestler, so technically he’s just got one year under his belt and to be able to go out and compete at this level speaks very highly of what I feel he’s got to look forward to the rest of this year and next year. Zac Schmidt took sixth at 160 pounds. Skylar Straszheim finished sixth at 220 pounds. Wade Monebrake missed the tournament due to an injury, but Silvers said the senior should be back and ready to go by the league meet. Silvers said the team will begin prepping for the postseason. “The key from this point on is to get everybody healthy, fine tune some things. There’s some technique we’ve go to improve and get better at,” Silvers said. “We building now for the end. We’re building to the peak. I feel good about where they’re going right now. Eaton was scheduled to host Covington on Wednesday for a dual meet. The Eagles will compete in the first round of the state dual tournament on Saturday, Feb. 2 at Hamilton Ross. The Eagles are the No. 5 seed. 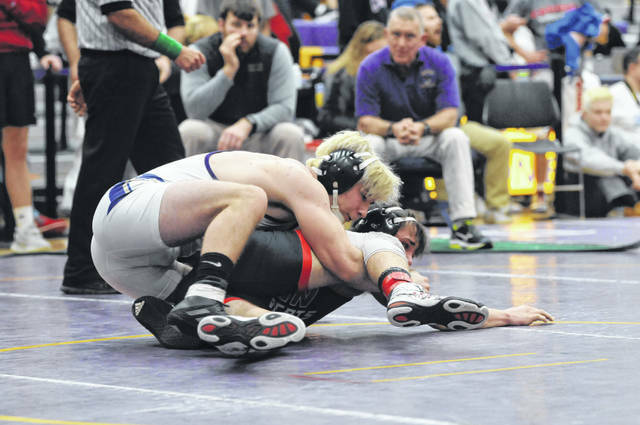 For Trail, Caleb Reynolds was fourth at 113 pounds and Jesse Bisner was sixth at 170 pounds. Returning state qualifier Peyton Lane wrestled one match and won before forfeiting his next two matches due to an injury. The Blazers are off the next few weeks. Twin Valley South had no wrestlers place among the top six. Tanner Brown was in the top eight at 106 pounds. 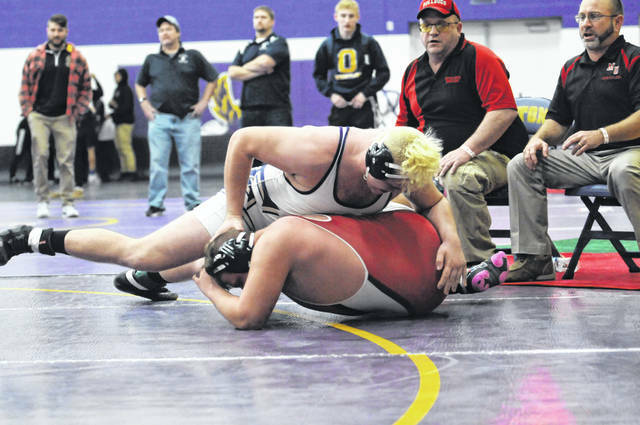 https://www.registerherald.com/wp-content/uploads/sites/41/2019/01/web1_ehswr_bowman.jpgEaton senior Seth Bowman scored a 3-1 sudden victory over Hunter Ross of Milton-Union in the third place match during the 49th Annual Eaton Sam Ridder Invitational on Saturday, Jan. 26. The Eagles placed sixth overall with 106 points. 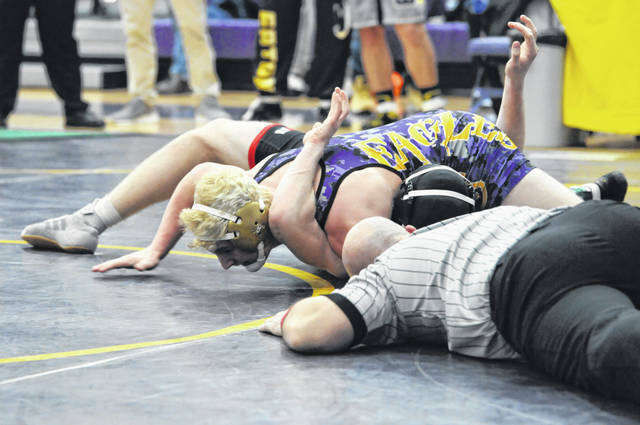 https://www.registerherald.com/wp-content/uploads/sites/41/2019/01/web1_ehswr_weadick.jpgEaton’s Chris Weadick battles Logan Raney of Franklin during a third place match at the 49th Eaton Sam Ridder Invitational on Saturday, Jan. 26. Weadick scored an 18-8 major decision in the match to help the Eagles to a sixth place finish as a team.